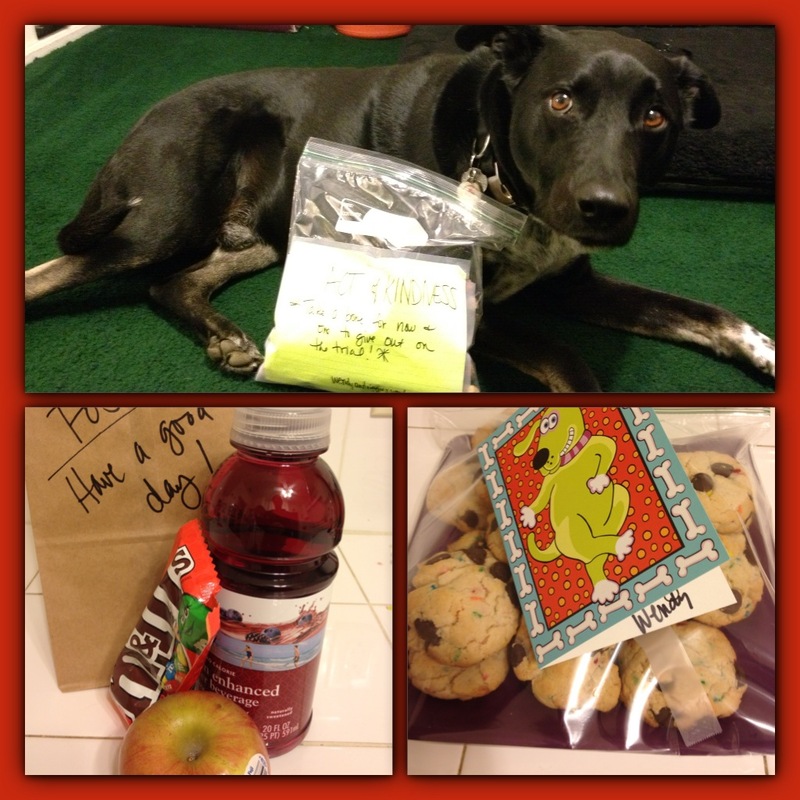 #6 – Treats for the postman. I had decided to leave a refreshing drink and a nutritious apple for my mailman and then glanced over and saw the M&M’s (the other day I raided the 99 cent store while on the hunt for niceness ammo) staring at me and had to throw them in. No one deserves chocolate more than that poor man. Every single time he comes to my door to bravely bring me my mail Riggins charges into the screen door aggressively barking as if the mailman was Satan himself. I definitely needed to include the chocolate! #7 – Treats for two cuties. Last night I backed some delicious (I sampled one so can say this with certainty) chocolate chip cookies for two sweet boys. Today after school they will come home to a yummy treat! I didn’t want these to be just any boring cookie so I made them cake mix cookies. Although there are many different versions of this recipe on Pinterest I used this one http://tinyurl.com/b8kmhzr, because it was easiest. Personally I thought there were too many chocolate chips but I have a feeling the boys won’t have a problem with that. #8 – Treats for the puppers. I’m sure by now you realize that my love for dogs is greater than my love for some humans. This makes it super easy to do nice things for them! I packed up some doggie treats and added a note letting owners know they should take one for now and one to hand out on the trail. This morning as we entered Runyon, Riggins and I duct taped the bag to the announcement board at the trailhead. I grabbed a few treats and gave them out to the owners that where around. Their dogs seemed mighty appreciative! Why the owners and not the dogs themselves? Glad you asked. Because Riggins forgot we were doing nice things and lashed out at one poor sweet dog as I was trying to give him a bone. Riggins can sometimes be protective of his treats and his water bowl. Apparently he felt he deserved the entire bag of treats and there was no reason he should share. I’ve packaged up a couple more Wendy Kindness Bombs that I need to drop in the mail. I’ve decided that I’m going to delay posting about things I mail to give them some time to get to their recipient. All that kindness and fun too! Maybe there is an animated dog movie I can lend my talents too. Liam loved his cookies! Every time we ask what he wants for dinner, “cookie!” is always his first response. They are delicious and a great incentive to get him to eat a good dinner. Thank you Aunt Wendy!! I’m glad he likes them and that their powers are being used for good!